Every year at this time, as the ground hardens and the snow flies, I think about the founders of Wabash College and their journey to the founding meeting. It would have been cold and very likely windy as well, but the little brick house of James Thomson would have been warm. Their dedication and enthusiasm led them to think big, to dream of a college in this wilderness. So in honor of their sacrifices, let’s look closely at our founding 182 years ago this November. The image above is from the Atlas of 1878. The location of the meeting was at James Thomson’s brick house west of this campus, where the R. R. Donnelly’s parking lot is now. 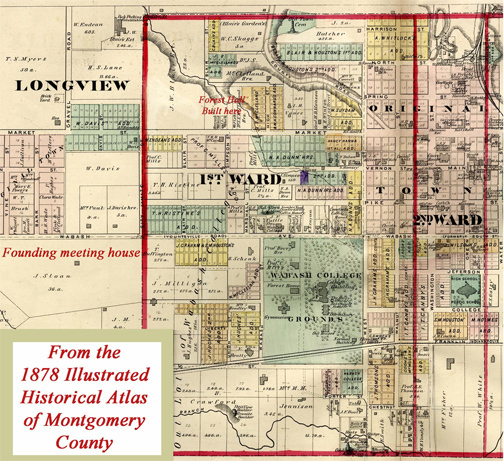 At the time of the founding Crawfordsville was a very small town, only four blocks wide and five blocks tall. When the Hoveys later moved to Crawfordsville and rented the same house, Mary described it as about a half mile from town. Near the top of the map is the area a few blocks north of here where Forest Hall was built. Also shown is the land which was offered by Williamson Dunn in the event that the project won approval. Dunn had already given the land on which Hanover was founded and donated land for the fledgling Indiana Academy (which would become IU). Several leaders among the Presbyterians in this part of the state had been discussing the possibilities of creating a school for some time. their primary motivation was to educate the men who would serve as ministers and teachers in this area of the country. On this chilly November day, the founders gathered from far and near. After a reading from the scriptures, a hymn and a prayer, the motion was brought to the floor to found a literary institution in this, the Wabash Country. 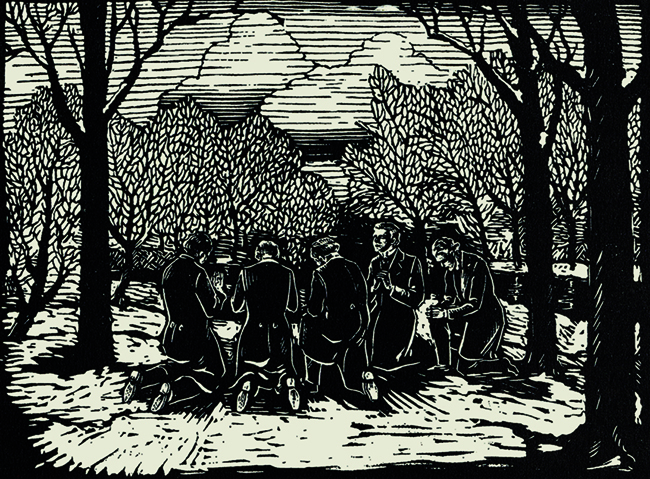 The next morning, Thursday, these young men (all but one under the age of 32 and he was only 41) gathered again and walked through the snowy woods to the land that had been offered as a gift from Williamson Dunn. They agreed on the fitness of the donation and it was here that the “Kneeling in the Snow” occurred. In 1916 the College dedicated a small stone which still sits on the corner of Lane Avenue and Blair Street (near Nicholson elementary school) and marks the site for posterity. Marker at the corner of Lane Avenue and Blair Street. In a letter from James Thomson to Williamson Dunn dated March 13, 1833, Thomson tells Dunn that for the time being they are calling the institution the “Crawfordsville Classical and English High School,” although they will apply for the charter next winter under another name. Thomson continues by saying that they will build a frame building – as they could not afford bricks. When Caleb Mills rang in the first class, the building was unpainted and all in all it made a humble start. “The ground was some distance northwest of the town, not far from Sugar Creek. No wagon road passed nearer than one or two hundred yards north of the building. The Western limits of the town extended to what is now called Grant Ave. West of that all was native forest, except a small place a short distance West of this Avenue on Main Street, where Nathaniel Dunn had his residence and tan yard; there were also other small clearings being opened up. 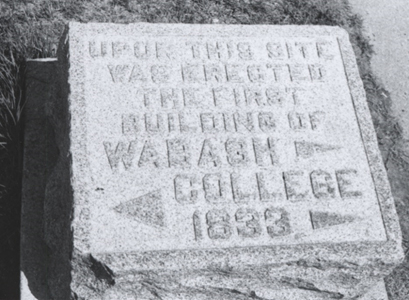 In 1835 Wabash purchased a quarter section of land, 160 acres, from Ambrose Whitlock. The trustees immediately held an auction, sold 100 acres off the parcel and made money. This money was used to start the construction of the building known simply as “The College,” as there were no other buildings on this site. 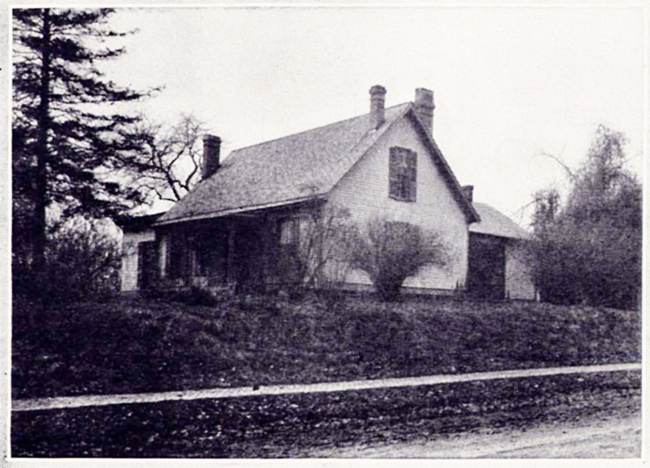 This is a picture of the Hovey Cottage in its original location just to the west [right] of the Wabash Avenue entrance, moved when Kane House was built. In a letter from November of 1835, Mary Hovey tells her sister that they have purchased 7-8 acres of land and will build a house. In 1836 Caleb Mills and Edmund Hovey built their homes and for the rest of their lives these two men lived and worked side by side. 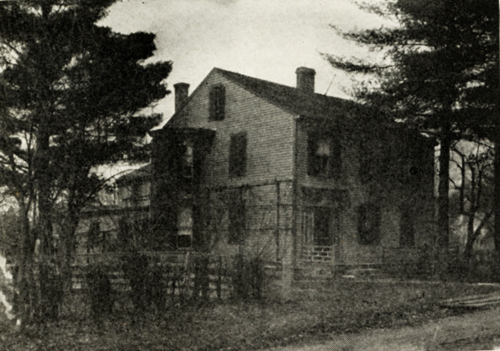 This is a picture of the Caleb Mills House taken about 20 years after the death of Mills. What is notable about this building is that of the three white frame buildings in our Historic Corner, only the Caleb Mills House is in its original location. So as we pass into the Thanksgiving season, it is nice to pause a while and think about the founders who were bold enough to start a college in the wilderness.